Oil – for deep frying..
Take a wide mouthed bowl and Mix all the items with little water & required salt to make a dough ..
Take a polythene sheet greased with oil.Make small balls with the dough. 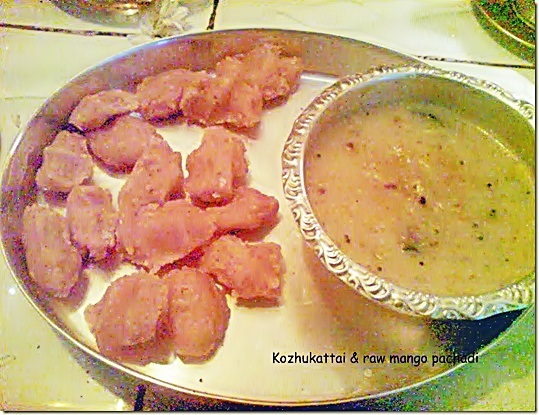 Pat it to make a round shaped thattu vadai on the sheet...(Its better to use a round shaped mould for proper size & shape ). Store in an air tight container and enjoy munching !! 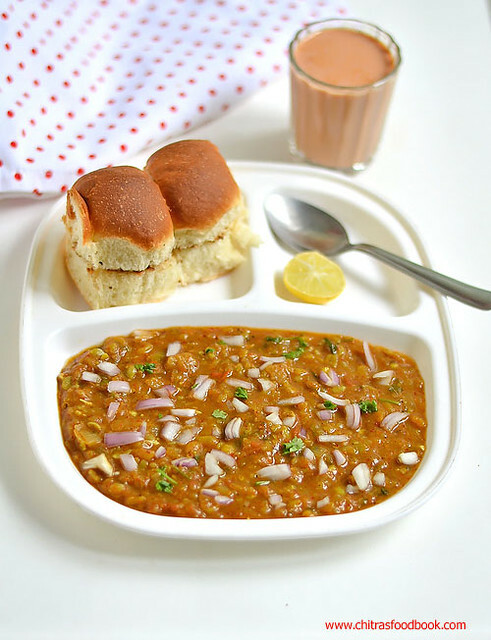 Instead of adding fried gram dal , u can also use 1 hour soaked chana dal..
U can also prick the thatti using a fork before frying to ensure proper cooking. Mix everything in a bowl with required water &salt to make a dough. Take the dough in the murukku maker with single star mould in it and press in the hot oil . Deep fry on both the sides and store it in an air-tight container. Note : The color of murukku depends on the roasted urad dal flour. If you roast urad dal till golden brown , the murukku color may be turn brown. So please roast urad dal in very low flame without changing its color. This is not the usual sundal we make with legumes/pulses.This is rice upma which my MIL call it arisi sundal. It can be made in a jiffy and its healthy too..Less oil is used.I usually make this for dinner.It tastes the best with coriander leaves thogayal or sambar :) As its a one pot recipe, it is ideal for bachelors and working women to make a quick dinner after coming back from office :) Do try it out and have a relaxed dinner ! Dry roast the rice till it puffs up slightly. Dry roast the moong dal till it turns light golden brown with a nice aroma.Set aside. Both the above process takes hardly 5 mins. Then in the same hot kadai , add 1 tsp of oil and do the tempering part. As i had mentioned earlier, half the quantity of asafetida should be added while tempering along with the dals. After tempering , just add the water,salt , roasted rice & moong dal. Now add the remaining hing and ginger pieces. Cook for 1 whistle .Cool, open and add the grated coconut before serving!! 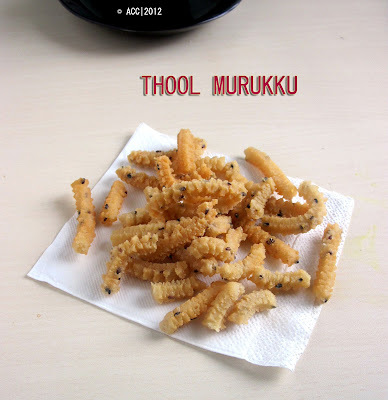 Serve with sambar/ coconut chutney!!! Remove the leaves and wash it for 2-3 times until all the soil gets removed. Boil 1/2 cup of water in a vessel and add the keerai /spinach to it. Cook it well and don’t cover the vessel with the lid. (hope u all know this:))After sometime flip it once and cook it. First,run the garlic flakes with the salt once or twice without water. Now add the cooked spinach and grind it to make a smooth paste. Mix with plain rice by adding ghee!! Try this with ur kids , i am sure they will like it.Garlic flavor is the plus for this kadaiyal.U can refrigerate it and use for 2-3 days!! Another version in this is, just cook the spinach and grind it with salt.Soak tamarind in water and extract the juice..Add the tamarind juice to the ground spinach and allow it to boil.Do the seasoning with mustard,urad dal and hing..This we call as pulikeerai..I think most of u do this at home!! Salt & water- as needed. Chop and wash the palak leaves for 2-3 times and set aside. Heat a kadai with 1 tsp oil and add the palak to it.Saute till its half cooked and get reduced in quantity. Then grind the palak with little water to a smooth paste. Now take the wheat flour in a bowl and add the ground palak, red chilly powder,ginger pieces,garam masala ,curd and salt.Add water only if it is needed because the water in the ground palak is itself sufficient.If u feel its too watery, add some wheat flour and make a dough.Add some oil and knead it well. Then cover and keep it for 30 mins.The dough is of green in color. Now make even sized balls and roll it to a thin chappathi. Heat a dosa tawa and make chappathis as usual. Yummy, healthy palak chappathi is ready.U can serve with onion raita and pickle!! The syrup starts to boil and becomes frothy.Now add the grated coconut,cardamom powder along with rice flour. Mix well till it becomes like a chapati dough.If the water is not sufficient,add little hot water..(keep the hot water ready before this step).First I used 3/4 cup of water to make the syrup,then I added 1/4 cup of hot water.If u feel the water is more,add rice flour..No problem:) .Now remove from the flame and let it cool. Grease the idly maker plates with gingely oil . Steam it in the idly maker as u make idlies..
Sweet pidi kozhukkatai is ready!! Pav bhaji is a worldwide popular street food originated from Mumbai, India.I prepared it for the first time yesterday and it was a super hit.It came out very well.I took this recipe from a cooking manual and made some changes by watching Mumbai pavbhaji YouTube videos.Sendhil & Raksha loved it a lot and told me to make the same next day too for dinner .It was awesome in taste when had with chopped raw onions.Its a great evening snack recipe for kids.Even bachelors can try this as it has no grinding jobs.I am sure,the smell of this pavbhaji masala makes everyone crave for it.Do try this for ur kids & Husband after they are back home.U will get appraisals for sure .Ok,lets see how to make this Mumbai special pav bhaji at home easily . 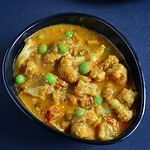 Wash and chop the vegetables.Pressure cook mixed vegetables and peas till well mashed for 4-5 whistles. Mash them well using a ladle/masher or hands after draining the water. Reserve the broth/vegetable water. Heat butter in a pan.Add ginger-garlic paste,finely chopped capsicum,onion,chilli & tomatoes. Add the reserved vegetable broth & bring to boil.Simmer till gravy is thick, stirring and mashing the masala,in between.Lastly add crushed kasoori methi,lemon juice,stir & switch off the flame immediately. Slit pavs horizontally leaving one edge attached. (like an open book). Apply butter (as desired) and roast open on a tawa till hot and soft with the surface crisp on open side. Serve hot with bhaji, a wedge of lemon and chopped onions. Adjust the quantity of spices as per ur taste buds. 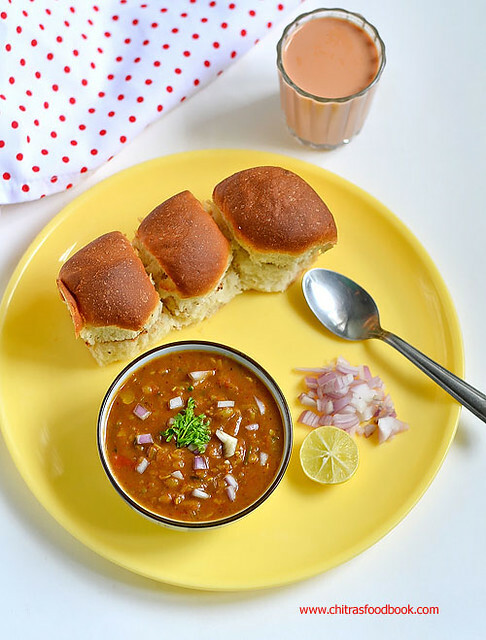 U must add pavbhaji masala to get the real taste.Else u can add garam masala powder & little aamchoor powder but u have to compromise with the taste. Add finely chopped coriander leaves for garnishing. 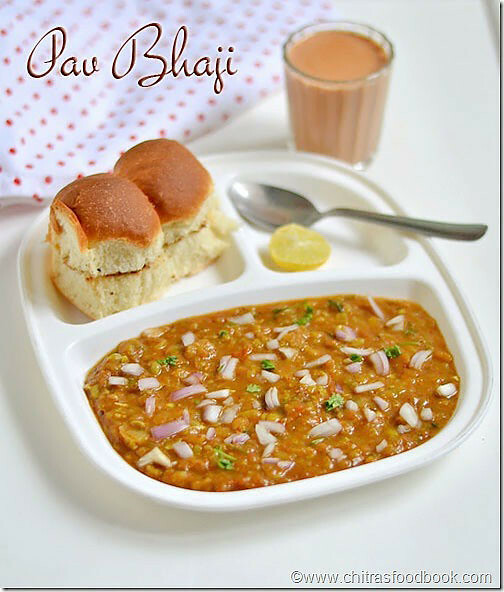 Mashing the vegetable well is the key here to resemble mumbai street style pavbhaji. 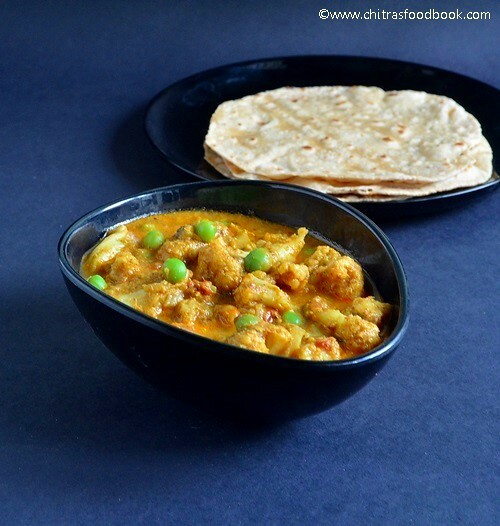 Adding carrot & beans is optional.U can use cauliflower,potatoes & peas alone. 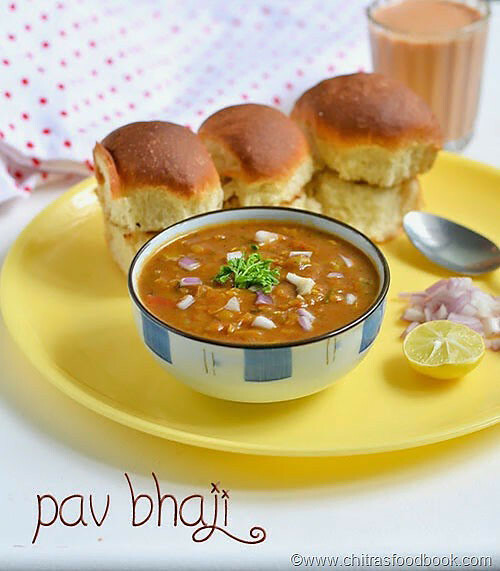 Yummy pav bhaji is ready to relish with Tea ! 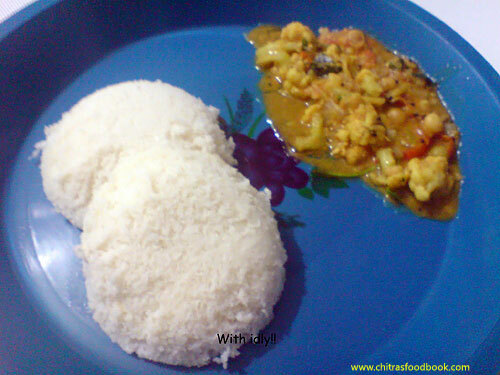 I always look for varieties of sambar/chutneys/kurma recipes for idli, dosa. Most of the Tamil people make idli/dosa at least 3-4 times in a week. Me too not an exception. Every time I used to hit my head for making side dish as I don’t like to repeat the same. So whenever I meet my friends or neighbors, I ask them about the side dish they make for idli/dosa/chapathi and try them in my kitchen. Last week my school friend Swarna called me and we talked more than one hour discussing our past, present etc:) I asked her about her idli sambar recipes. 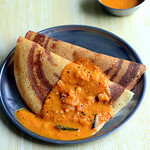 She told me this easy tomato sambar recipe without dal ( Thakkali sambar in Tamil) for idli,dosa. I love to try varieties of tomato recipes. So I got tempted and prepared it as a side dish for dosa. 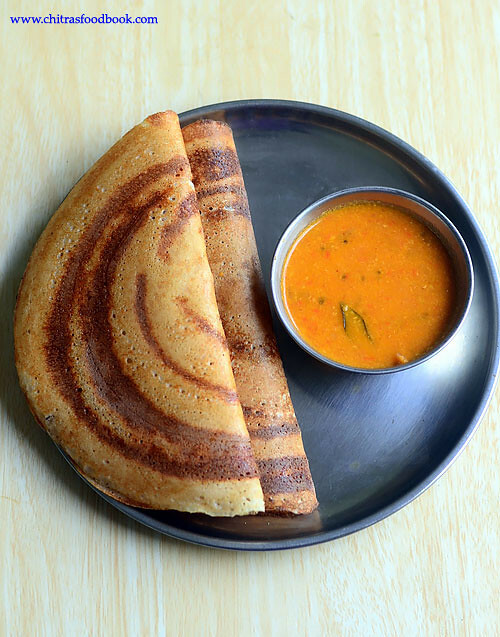 Basically Sendhil loves to have juicy sambar recipes more than chutney varieties for dosa. So he loved it very much. 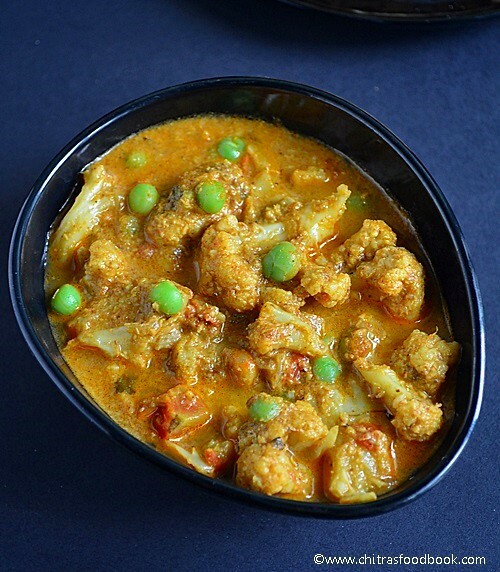 This sambar has a mild masala flavor. It tastes well with chapathi too if you make it little thick like kurma by adding more coconut. Its a very simple and delicious recipe. 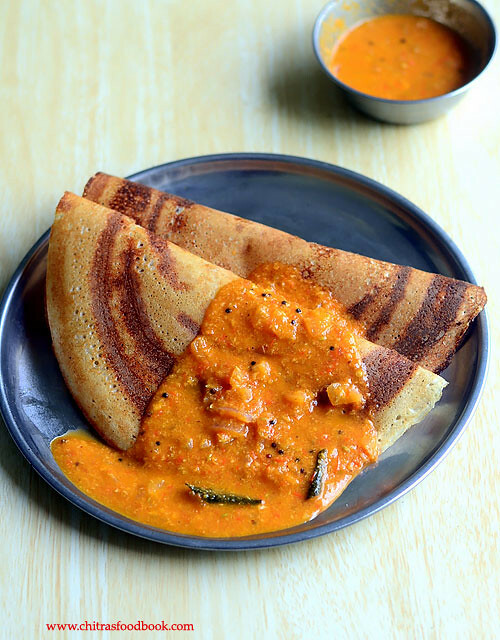 Lets see how to make this yummy thakkali sambar for idli,dosa ( Tomato onion sambar) ! Chop and cook the tomatoes adding enough water. Grind all the items given under “to grind “ along with cooked tomatoes adding required water.Make it a paste.Set aside. Now heat the kadai with a tbsp of oil and season all the items given above.Add the chopped onions and saute till transparent. Add 1/2 cup of water and cook the onions till soft. Now add the ground tomato masala to it and boil till raw smell leaves it. May take 5 mins.Add water if u make it for idly/dosa.If you make it for chapathi, add less water and make the gravy thick. Finally garnish with coriander leaves and serve!! Enjoy ! Adjust the quantity of chilli as per your taste buds. Here I have not used whole spices like cinnamon, cloves etc. 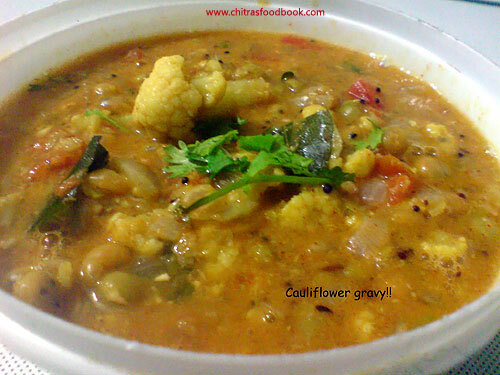 So this sambar tastes mildly spiced with ginger & fennel seeds flavor. If you wish, u can saute the whole spices along with onion for more masala flavor. Garnish this sambar with coriander leaves if you have in hand. 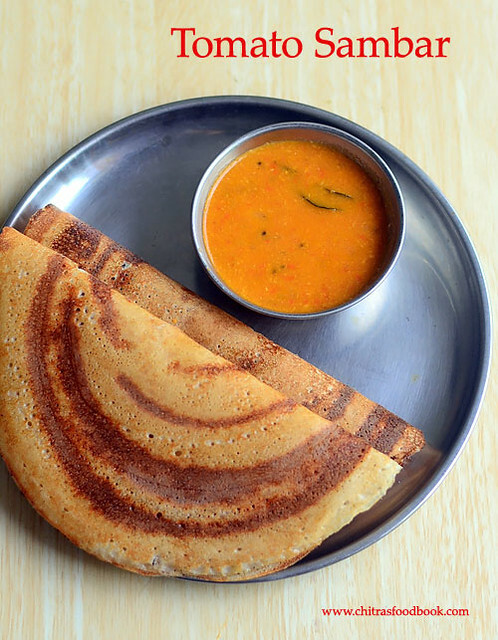 Enjoy this yummy sambar with hot hot idli & dosa by drizzling a tsp of gingely oil ! !